Battery Wash Cabinets clean harmful contaminants from a battery’s surface, which extends the life of the battery and reduces electrical problems in lift trucks. This mobile unit allows service providers to offer on-site battery washing with the push of a button, so fleets experience minimal downtime during a crucial maintenance task. The Mobile Battery Wash Cabinet also gives flexibility to warehouses that wash their own batteries. Fork pockets enable lift trucks to carry the BWC-1-M to different locations as a facility grows or battery room configurations change. This Battery Wash Cabinet model is equipped with a manual door and friction strips. The BWC-1-M utilizes 120 V single phase power with an adjustable timer and allows batteries to drip dry. The unit does feature fork pockets for mobility, but they are not to be used while battery is on unit. 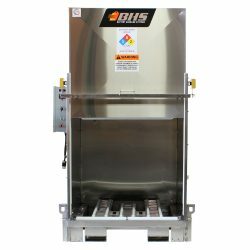 Mobile Battery Wash Cabinets from BHS provide a battery washing solution wherever you need one. Contact our sales team at +1 314 423 2075 to learn more about the BWC-1-M or other Battery Washing Equipment.